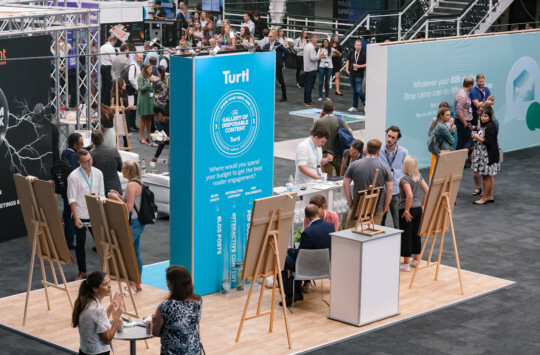 Technology for Marketing is the UK’s leading Martech event and took place last week on Wednesday and Thursday at London Olympia. We joined the action for a day to gauge where the industry is at and give you an update on the latest trends to keep an eye on. As ever with large events, there were a lot of buzzwords flying around, and in addition to the now usual suspects like CRM / email / marketing automation, big data and lead generation, new topics were coming up namely AI, bots, machine learning, VR and AR. No surprise then really as these reflect evolution in technology and the growing number of tools marketers can add to their martech stack. As a content platform ourselves, the sessions we attended were mostly around content marketing, so here’s a summary of what we saw and heard. This first session, led by Sue Yoxall from a company called Mkodo, was all about showing how augmented reality (aka AR) can now be used for marketing campaigns. AR has been made popular recently by social apps like snapchat (think animal filters) or Pokemon Go (remember those?). The fact that it only requires your audience to have a mobile or tablet to work is a big benefit over virtual reality (VR) which requires more advanced equipment like dedicated headsets. As AR becomes more mainstream, the marketing applications start to grow, particularly in the cultural and entertainment space, and in retail, with companies like Ikea using it for their Ikea Place app. Although AR is exciting, the marketing applications are probably more suited to B2C companies, and the technology is still a few years away from becoming a “must have” marketing tool. Paul Fennemore, Digital Marketing and Transformation Consultant at Sitecore, took us through how businesses should focus on customers’ expectations when designing customer experiences. Too often marketing teams focus on good customer experiences that are not aligned with what their audience is expecting, leading to wasted opportunities. Good omnichannel (as opposed to multichannel) strategies should make use of the right technology for the right audience to provide the best CX. With web 3.0 just around the corner, the ultimate aim for successful digital transformation should be to align technology with objectives. Content: Outsource it? DIY? Or something in between? The last session we attended was a panel discussion in the keynote theatre and was all about content marketing. Moderated by Ryan Skinner, Senior Analyst at Forrester, the talk started with a question for the audience: is the use of content increasing, stagnating or decreasing in your company? the answer was a resounding “increasing” from the vast majority of attendees, which is reassuring for us! Ownership of content then came up, with some of the panellists agreeing that CMOs should be leading content strategies., although this still seems to be a key question for many businesses. Ryan Skinner then mentioned that a recent Forrester study found that 40% of marketers are planning to bring content in-house, and the panellists were asked their opinion about this. With all of them working for agencies, it’s no surprise that they tried to fight their corner, but their answers were quite pragmatic. Not every business will have the tools and expertise to produce content, and the inability to sign things off quickly could also be a potential barrier to bring content in-house. Having a symbiotic relationship between client and agency is very often the best solution, but all agreed that having a content evangelist within a business is often the best way to move things forward.. They also emphasized the importance of auditing existing capabilites and content to really maximise performance. The next topic covered was Artificial Intelligence (AI) and the impact it can have on content teams. Are we moving towards a time where machines can produce better content than humans? According to the panellists, AI generated content still has a long way to go before it can replace humans, and the creative aspect of things will more than likely always need a human touch. AI content can however be useful in very specific context like product descriptions for large ecommerce sites or translations. It is always interesting for us to see how the martech industry is evolving, and by the look of things we’ve got a lot to look forward to in the coming years, and content marketing is still very much at the heart of strategies. Did you attend TFM? Let us know what your key takeaways were. GDPR, what is it all about?